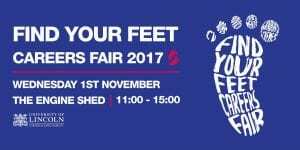 The Careers team’s ‘Find Your Feet’ Careers Fair will take place from 11:00 – 15:00 on Wednesday 1st November in the Engine Shed. The fair is open to all undergraduates, postgraduates and graduates and attracts around 70 domestic and international graduate recruiters, volunteer and third sector organisations and educators. Notable employers include: Enterprise Rent-A-Car, IBM, Siemens, British Steel, Anglian Water, Lincolnshire Police, Next, CCUSA, NHS – Lincolnshire Talent Academy and Royal Air Force. No booking is required – just turn up and meet the exhibitors! All students are invited to the School’s annual Alumni Event, which will be held in the Human Performance Centre between 5 and 7pm on Thursday 9th March. After brief initial introductions from each graduate there will be a chance to meet and chat with them on an individual basis. Come and find out more about the careers that your degree programme can lead into, hear advice from those already succeeding on those paths, and discuss your ideas and plans with them! If you have any questions, please email Lindsay Brown. Sports Therapists, PE Teachers, Sport Development Officers, Fitness Instructors, Professional Coaches, Community Development Officers, Sports Science Support and Sports Interns. Who: All our students are encouraged to attend. Students have found the advice and connections resulting from previous events very useful. A free buffet will be provided. On Thursday 11th February we will be hosting a Careers in Sport LIVE event in the Sports Centre and Human Performance Centre. This is a careers roadshow that brings together exhibitors from across the sports spectrum with careers presentations, demonstrations and workshops. It was a very successful event last year and we think the programme is even better this time around! Steve is a physiologist who has worked with many of the country’s most famous athletes, and will share his thoughts on careers in high performance sport. Adam is a Sport Development & Coaching graduate from Lincoln who was first team performance analyst at Rotherham United before becoming a technical scout at Sunderland. Tickets are free but do need to be booked in advance. Numbers are limited so reserve your ticket here now! All are invited to the School’s annual Alumni Event which is taking place in the Moot Court in the David Chiddick Building (BL1102, Business & Law) between 5.00pm and 7.00pm on Monday 9th March. This is a great opportunity for students to meet alumni from a range of sport and exercise-related professions, and to gain advice and tips about pursuing diverse careers. The alumni will introduce themselves briefly, followed by an informal session where you will have the chance to speak to them individually. A buffet and drinks will be provided. All are welcome, and no booking is required.